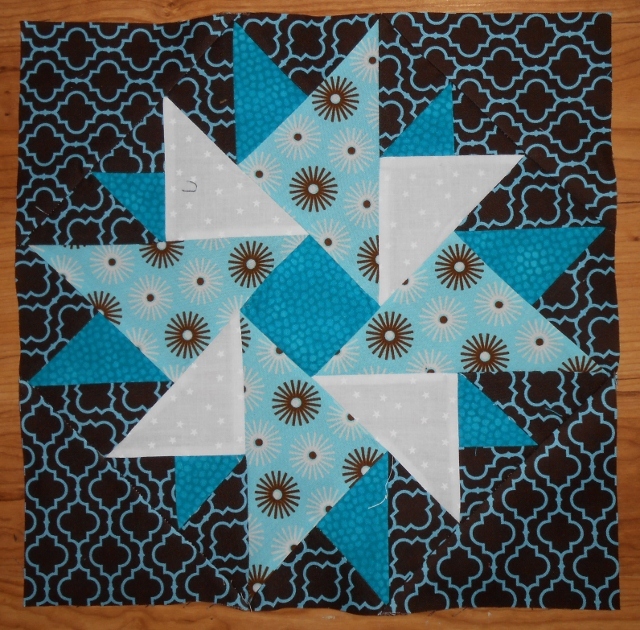 After spending 2 days searching for the name of this star I have come to my fellow quilters for help. Can you name this block? Sorry no help but it is beautiful going to watch this thread. Yep....look at Aprils block of the month. It is the "Double Aster". There is a link to instructions....the link is to the Quilters Cashe. Speaking of beautiful blocks, your avatar is stunning...what is the name of your block? Judy, if you are referring to mine (it does get a lot of attention). It is from the book "40 Bright and Bold Paperpieced Blocks" by C. Doak. it is the 18# block in the book. I absolutely love her blocks. This one in particular was made for a Boom 9 swap buddy. She sent the busy fabric and I supplemented and it turned out perfect. It was my favorite block I did in the swap. Last edited by alikat110; 07-14-2013 at 06:11 AM. Btiny: love the block think I will have to be add to my someday list. Well I'll be darned....I searched that darn site for 3 hours But I guess I was only searching under star blocks....Great big Quilty Hugs for the help..... And it does look very complicated "yikes"
Wow went to see pics of everyone's block of the month for April....excellent job to everyone who participated and posted pics. Really like the double Aster. Think if I made it I would convert it to PP. Barbara Brackman's "Encyclopedia of Pieced Quilt Patterns" identified this as "Double Windmill" and credits it to Nancy Cabot. However, with a change in fabrics she also uses "Double Aster" as an ID, again Nancy Cabot. Yes, Thank you Alikat110....I suspected it may be paperpieced...I am taking the Craftsy Paperpieced class with Carol Doak, so I will look this one up once I have some more practice...thx again for sharing. Beautiful block...the link to quilter's cache does break down the pieces and cutting well...would just try one block a step at a time and see how it goes. It's very pretty! I love the fabrics and colors. It is a pretty block. This star reminds me of one in Judy Martin's scrap book, purchased decades ago. She calls hers Oriental Star and is on my bucket list. I would call it "a beauty" but I am sure that's not the real name! Lovely block, looked at pattern on quilters cache, I might try this on a one block that could be used as a mug rug for the table. This would give me a chance to see if I would try it on an entire quilt. I do see ***scant 1/4 inch seam***! Anymore I use a scant and find it works better for me. Pretty block and does look challenging. Thanks for sharing your question. Could it be paper pieced??? I didn't know the name of the block but it is fantastic. I am so happy someone had the name for you. I have never seen this star pattern before but yours is awesome. Thanks for sharing. Loooks like a Carol Doak block to me but not sure. My mom made me a quilt using that block. It is made in all purples. She said the hardest part of making it was keeping the pieces in the right place and keeping them turned in the right direction.